One of the great names in the Champagne region is Taittinger. Champagne Taittinger was founded in 1734 by Jacques Fourneaux. It is the third oldest Champagne house in the region. The current family that owns Taittinger started in 1931 with the purchase of the Forest-Fourneaux vineyards by Pierre Charles Taittinger. Taittinger concentrates on using Chardonnay grapes for their wines but do also add in Pinot Noir and Pinot Meunier for some of the wines. Chardonnay I was told from a previous discussion I have had with a winery in Champagne, produces finer bubbles than from Pinot Noir and from Pinot Meunier. 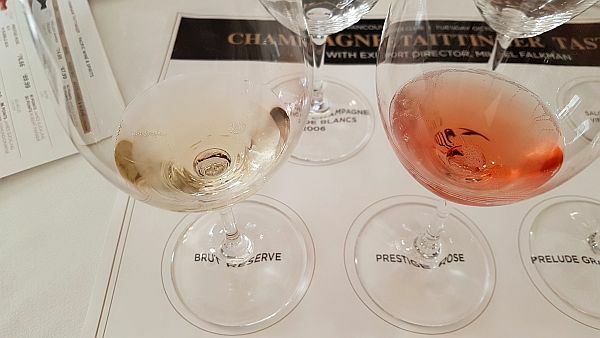 I was fortunate to be invited to a Trade only tasting of Champagne Taittinger in Vancouver. The seven sparkling wines were all top quality and it is hard to say one is better than another when you get to a such a high level of quality. Although I do give them my rating, it is a very fine line that separates one from another. Mr. Mikael Falkman, Brand Ambassador for Champagne Taittinger, lead us through their line up of wine, as well as gave us some background on each wine. Mikael reinforced my knowledge of using Chardonnay for Champagne by indicating that it brings out the character and style of their wines; light, elegant and with finesse. Champagne Taittinger Prestige Rosé N/V ($89.99++) – The second most important wine they make. This Rosé is made by the l’addition technique, where red wine is added in a small amount to a white wine in order to impart the rosé colour to the wine. The blended wine then undergoes its refermentation in bottle. This wine as well spends 3 years on its lees before disgorgement. It has a light crab apple skin or a salmony orange colour depending on how you look at it in the light. Light toast, along with red fruit, in particular, strawberry on the nose. Dry, with high acidity, and tiny, fine creamy bubble. Crisp red fruit and red apple flavour, along with some candied red cherries as well. Fruity. Medium plus length. With air, I also picked up a floral component to the wine. Champagne Taittinger Prélude Grands Crus N/V ($87.99++) – a 50/50 blend of Chardonnay and Pinot Noir. The grades for this wine come from all Grand Cru vineyards, which all have a chalky soil. I was also told that the chalk increases the acidity in the wine. With this step up in vineyard quality, this wine was aged for at least 5 years on the lees. It is a medium, bright lemon colour. Lees and lemon aromas on the nose. Medium body, with bigger bubbles that dissipate faster (remember what I said earlier about the type of grape and fineness of bubble?). Off-dry with flavours of citrus and apple skin, and some toast. Higher acidity in this sparkling wine. Champagne Taittinger Nocturne Sec City Lights ($79.99++) – The previous 3 wines I have described are all dry with 9 g/l of sugar in the bottle. This wine is a bit sweeter at 17.5 g/l of sugar and was developed for I think the younger generation and the nightclub culture. This style of wine was started only 10 years ago. It is a deeper lemon colour in the glass and has a toasty, bready, and ripe apple nose. It is off-dry with high acidity and small bubble that dissipates quickly. It is medium bodied with a rounder mouthfeel (coming from the additional sugar). Some stony minerality and bitterness on the finish. Mikael noted that this wine would pair very well with sushi. Give it a try. Champagne Taittinger Comtes de Champagne Blanc de Blancs 2006 ($255.99++) – A vintage champagne, as you will see the others above are all Non-Vintage (N/V). Champagne Taittinger, operates from the cellars of the Saint-Nicaise Abbey in Reims. When cleaning up the cellar, removing old walls, etc. they came across the type of bottle used by the monks for their wine. This bottle shape is now used for the Comtes level of wines. The Comtes wines are also not produced every year. The wine must reach a certain level of quality before being identified as Comtes quality. It is made from 100% Chardonnay grapes from Grands Crus vineyards and only the grape juice from the first pressing is used. 5% of the wine is aged in new oak barrels for 4 months. The wine once blended and undergoing its second fermentation in the bottle, waits at least 9 years, typically 10 years, before disgorgement. 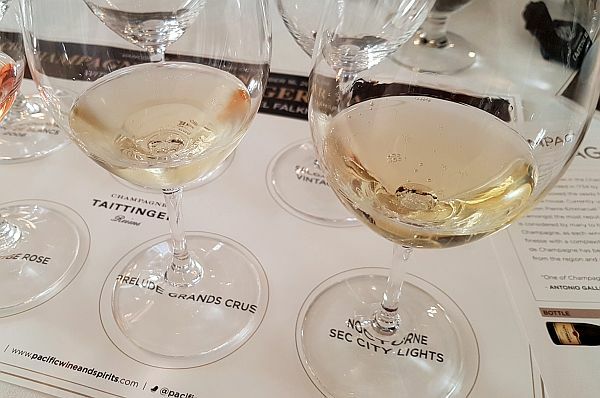 If you are a Champagne lover, Mikael noted that 2018 is a Super Vintage, so once these wines are released to buy as many as you can. This wine from the 2006 vintage is a bright medium lemon in colour. Deeper aromas of toast, citrus and hazelnuts. Higher acidity. Small to medium-sized bubbles. Apple skin and toasty flavours, with some minerality on the finish. This wine has structure. Solid quality. A balance of fruit and acidity. 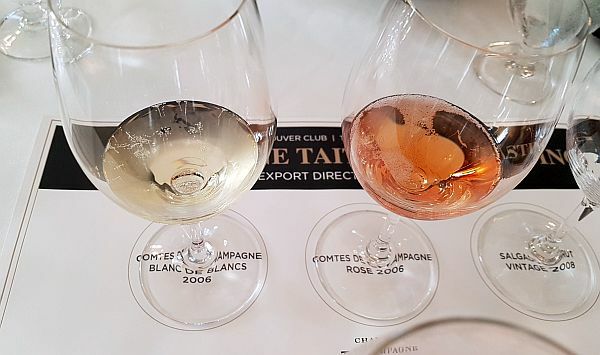 Champagne Taittinger Comtes de Champagne Rosé 2006 ($290.99) – This rose is also made with the l’addition method, and is a blend of 30% Chardonnay and 70% Pinot Noir, again coming from Grands Crus vineyards. The wine spends 8 years on its lees. This wine has a light coppery colour in the glass. A light intensity nose; a mix of red fruit and bramble and some toast. The wine is dry with a medium body. Small creamy bubble with a tart biting edge. Light red fruit flavour, along with nutmeg that leads into a bruised red apple flavour. A complex wine. Champagne Taittinger Salgado Brut Vintage 2008 ($399.99++) – This is their Artist Collection Series, where an artist that they select does the artwork for the bottle. 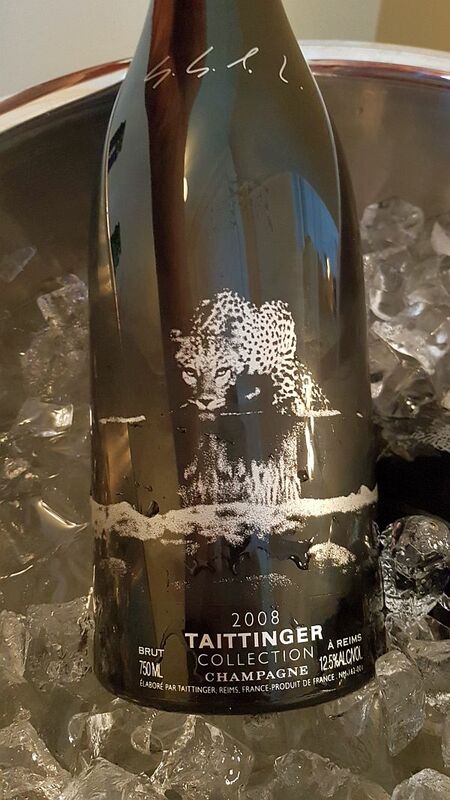 For the 2008 vintage, their 14th edition of this wine, a Brasilian artist, Sebastiao Salgado was selected. He is a photographer. His photo on this label is of a leopard in the Barab River Valley in Damaraland, Namibia, drinking water. This wine is medium intensity bright lemon colour. Light toasty nose mostly, but there is also some apple. Medium minus body with fine, light, creamy bubbles that also have a tart edge. Light toast and apple on the palate along with salty minerality and lees toward the finish. An elegant wine. 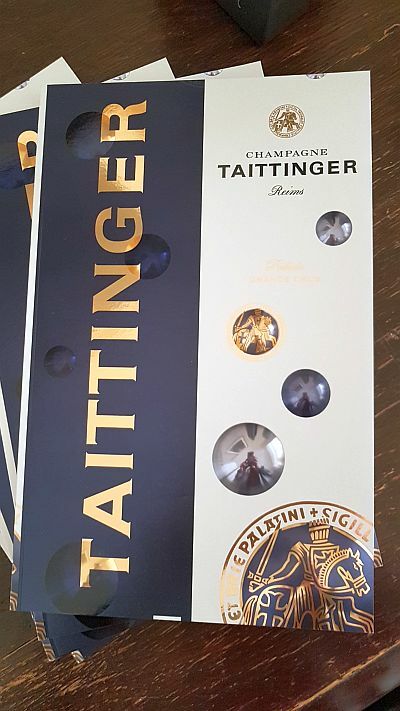 I hope you enjoyed reading about these sparkling wines and will consider trying Champagne Taittinger with family and friends. Champagne is a wine you can enjoy anytime, holidays included. Here is a link to the BC Liquor stores listing of Taittinger Champagnes. Thank you to Mikael Falkman for leading through this tasting and giving us some background on each wine.